Well I am continuing my climb up that big learning slope and I'm feeling a little euphoric about how far I've come, but also a little scared to look at the view off the edge. Truth be known, I keep looking at it and thinking, I reckon the size is totally wrong, but I'm actually too scared to offer it up as if it looks ridiculously small, I WILL cry! It has been an odd kind of week, and not in good way, but we at least finished it off in the best way. A walk along the beach to blow away all the cobwebs and to vent a little steam.....also a proper walk for Chester who is now properly covered by his vaccs. If you would like to see fellow bloggers' Year of projects work then check out the ravelry page here. I think your jumper looks fine. Have you measured it to see if it is to gauge? Will it stretch a wee bit after it is blocked? Love the photos by the water. That would be very relaxing. Your jumper is looking wonderful, and I'm sure the size will be perfect. But I love the back-up plan. 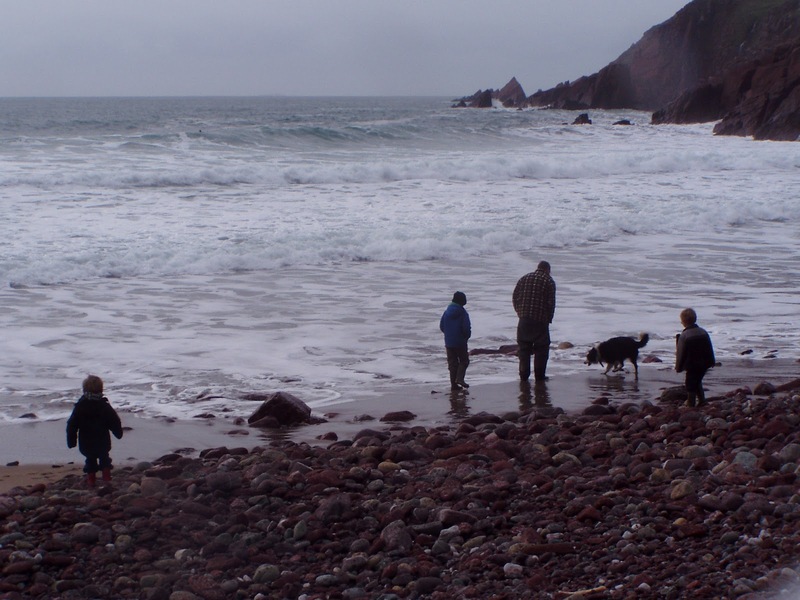 Lovely beach photo, wish we lived nearer the sea, there nothing like a beach walk to clear the head. We have been out in the forest in the snow, but I was mostly ducking snowballs!! 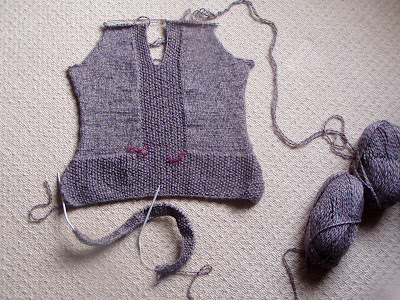 Love your jumper and Marsha is right, check the gauge and remember blocking can work wonders! 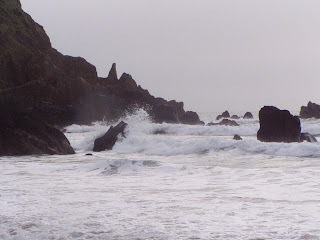 Love the pictures, thats how I like the sea, wild and wavy. I wish I could comfort and say it is ok, but knitting isnt my territory at all! Hope it does well though. 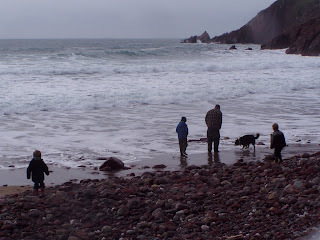 oh yes, this Cornish exile misses the sea. I adore the Welsh coast. The jumper looks perfect. If it's too small, it's too small, but you'll still have climbed that learning curve. Looks to me like you could measure the jumper and measure yourself to get some idea about the fit. You could also measure out and calculate your gauge to see if you're on track with the pattern instructions. My fingers are firmly crossed for you! I would say don't worry about the sizing until it's finished and blocked! I hope it fits, but it looks great so far! your jumper looks great and you have a great bak up plan!!! That beach looks amazing- no wonder you're proud to be Welsh!!! I think it's looking wonderful so far. Keep going! I have to admit, I'm kind of jealous that you're Welsh. I'm a basic Western European mutt living in the US...oh well. Also, I'm jealous of your knitting ability. I can't knit that fast (or maybe it's because I have Little Man at home with me?). It took me almost a year to make a sweater and as much as I love it, I wish it was just a smidge longer. Oh well...I'm not redoing it. I think it is looking really good up to now, and like the others my adviceis to wait and see what it looks like when you have finished. The beach/sea pics look fab, theres nothing like a walk by the sea to blow the cobwebs away.Sadly our nearest coast is about 65 miles away so we dont get often! What a cute garment. So neat how it's construction's made up. If it's too small, I'm sure you can find a child to fit it yeah? Chalk it up to a learning project so the second time around will be faster and so much betta. Looks amazing - the cardigan and the sea! And today I gave yo the Versatile Blogger Award too! The jumper looks great even if it turns out too small. How do Chester and the sheep dog get along? The beach photos are wonderful! Your jumper looks fine- if not right I agree offer it up in a giveaway only to be entered by midgets. Love the beach shots, I long for the smell of the sea!!! Hi Faith! I have given you the Versatile Blogger Award too! HI, Guess what I just nominated you for the Versatile Blogger Award also! Hope you have a great day!!! Oh how I love the ocean--your pictures are stunning. I say keep going on your sweater, and make decisions abut what to do with it after you are done. You might be surprised in how different it is after blocking. I love the jumper so far. Good idea to launch a fabulous giveaway it it all goes pear-shaped!